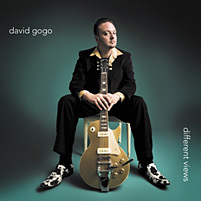 For his 10th album, Different Views, blues rocker David Gogo definitely had some unique sights to inspire him during the recording process. Instead of the usual confines of your typical recording studio, the bulk of the album was recorded at his home - overlooking the 160-acre Christmas tree farm and forest that make up the Gogo family compound. The keyboard tracks were recorded at Rick Hopkins’ (Colin James, Barney Bentall) home overlooking breath-taking Lions Bay, British Columbia. The album is produced by Russell Broom (Jann Arden, Sam Roberts, The Dudes, Wil) with guests Shaun Verrault (Wide Mouth Mason), roots diva Carolyn Mark, and jazz great Phil Dwyer popping in at various times. With the drums set up in the foyer and guitar amps in the laundry room, the Gogo house was filled with music and good food. At times, Gogo wasn’t sure if he was a musician or a caterer! The fact that the clock wasn’t ticking, along with Gogo’s vast collection of vinyl albums, vintage guitars and pop culture memorabilia at their fingertips encouraged a stimulating creative environment. This combination has added variety and spice unlike previous Gogo efforts without losing focus of what he’s all about.